Your cat’s kidneys play a very important role in most of its bodily processes. The kidneys help control the blood pressure and they produce a variety of vitally needed hormones and enzymes. They help with the production of red blood cells and remove metabolic waste, like urea, mineral salt, and poisonous substances from the blood. About 95% of the total fluid blood volume that originally entered the kidneys is “cleaned”. Then the cleaned blood is circulated back to the heart and travels through the body again. The remaining 5% of the fluid, containing waste products, is passed along as urine from the kidneys to the bladder and eventually excreted. If the filtering system of the kidneys breaks down, toxic waste can accumulate in the recirculating bloodstream, and severe complications may affect other organs. There are two categories of kidney failure (renal failure): acute and chronic renal failure. For acute renal failure, if diagnosed at an early stage and treated immediately, kidney damage is potentially reversible. Common causes of acute renal failure can include blockages that interfere with the flow of blood to the kidneys, or ingestion of substances that are toxic, like antifreeze, pesticides, or human medications. When treatment is immediately administered, the prognosis for a full recovery can be good. 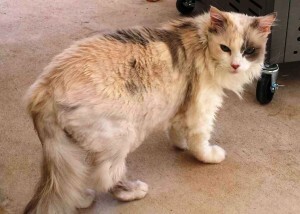 For chronic renal failure, it is an in curable condition that mainly afflicts middle-age and older cats. It occurs when 75 percent or more of functional kidney tissue has been destroyed and replaced by scar tissue. The onset and progression of this condition is gradual, extending over many months or even years. By the time a cat is showing signs of chronic renal failure, some cats can live for one to three years following early diagnosis. Symptoms of kidney failure can be increase in water consumption and urination, weight loss, apparent decline in appetite and in some cases, vomiting may occur. If you see these symptoms in your cat, give us a call and we can make you an appointment. If you have any questions, please call at 505-869-2627.